Ahhh the famous spanakopita. A favorite appetizer, meal, and snack not only in Greece but around the globe. Go into any bakery in Greece and you will find this wonderful pie, made with spinach and feta surrounded by crunchy (and often messy) phyllo. For us spanakopita is a weekly staple and I also keep a bunch in the freezer for a last minute meal. This recipe here is my mothers. 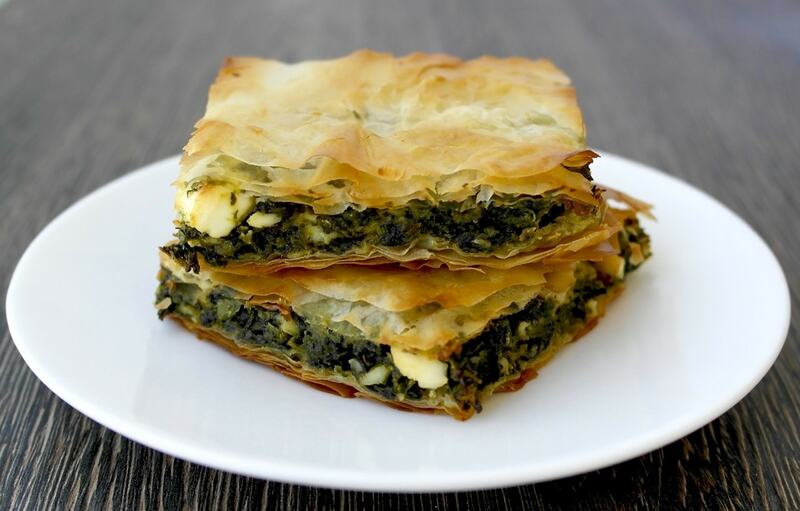 Although spanakopita is pretty much a basic recipe consisting of spinach, herbs and cheese (or no cheese for the vegan –nistisimo version), the types of herbs used, the ratio of cheese to spinach, the phyllo, all make the difference. Depending on the recipe you may end up with a delicious pita or with a bland one. The filling is not supposed to be salty but rather mild and almost sweet. The addition of soft sautéed onions (sometimes leek) and sugar provide that sweetness. Do not add garlic. I know you want to, after all spinach and garlic are often cooked together, but again the idea is to have a somewhat sweet filling, garlic is an “intruder” in this particular recipe. Be careful with the ratio of filling and phyllo. I often see photos of spankopita that has a real thick layer of filling, but when you are using the thin phyllo you have to make sure it can hold the filling. In addition you want to make sure that every bite has the right amount of filling in relation to the phyllo, not too much and not too little. If you want a thicker filling than you will have to use a thicker phyllo (here is a recipe for that). Do not expect pites made with this phyllo to be neat, they are messy. This phyllo is tasty and crunchy but it will break. Now back to the recipe. So this recipe is actually lighter than the typical spanakopita. There is a just a bit of olive oil in the mix, and you can adjust how much feta you want to add or you can choose not to add feta. 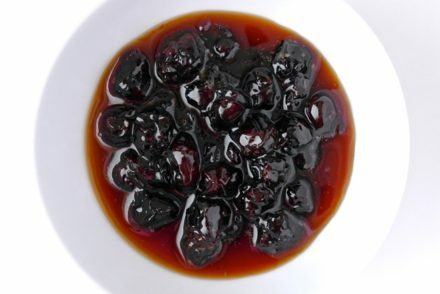 As a side, it is a great accompaniment to meat or fish. If serving as a main, I often accompany it with a small tomato salad, some olives and a bit of cheese. But as noted above, I often serve it as is especially for lunch. *Here in Greece we have plenty of ready to bake spanakopites that you can find in the freezer of the super market. Unfortunately, nowadays many of them use palm oil in the place of olive oil which defeats the purpose of having a healthy pie. I’d rather make it myself. And this pita is so easy, especially if you are using frozen spinach as I did here. 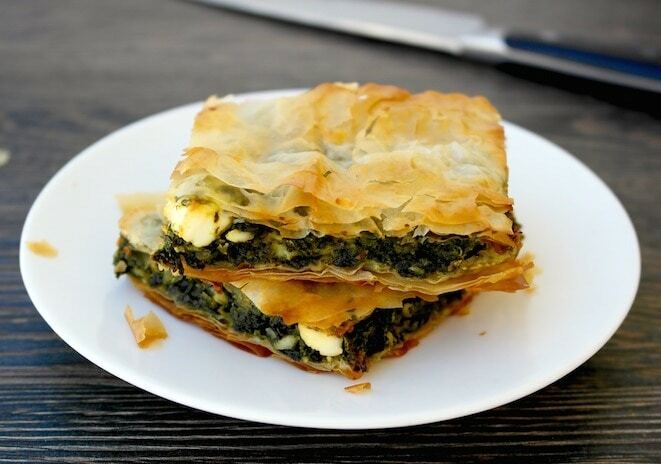 The authentic Greek recipe for spanakopita, spinach and cheese pie. A baked spinach pie with herbs and feta cheese covered with crunchy phyllo. Easy to make and healthy. Heat a medium pan with one tablespoon olive oil. Sauté the onions until soft. Add the spinach (make sure you have squeezed out the water). Sauté spinach with onion for a few minutes. Add the herbs, nutmeg and sugar and sauté for 2-3 minutes more. Set aside and let it cool. 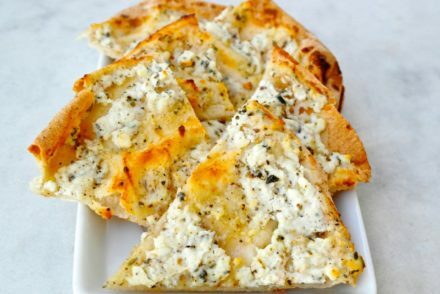 Grate half of the feta and crumble the rest. In a small bowl beat the egg and add the feta. Add the egg mixture to the spinach and add the other tablespoon of olive oil. Mix so that all the ingredients are blended. Brush a pan that is about 10 X 15 inches with olive oil. Place a sheet of phyllo in the pan and brush with olive oil. Repeat with 5 more phyllo sheets. Spread the spinach mixture evenly. Cover with 6 more phyllo sheets brushing each one with olive oil. Cut the phyllo hanging over the pan or roll in. Score the top with a knife (do not cut all the way through, just through the top phyllo sheets) for about 10-12 pieces. Bake for about 40 minutes until phyllo is golden. Remove from oven and let the pita cool. Cut in pieces. Enjoy at room temperature or if you want the phyllo crunchy, warm in the oven before serving. You can freeze this before baking: assemble in a pan, cover and place in freezer. You can bake it right out pf the freezer. You can also freeze this after baking: let it cool , cut in pieces, wrap and freeze. Reheat in the oven. Have been waiting for this recipe. Have enjoyed many of your Blogs and Recipes, and can’t wait to make this one. Thanks you for introducing me to Greek food and life. This has been one of my favorite foods since I was a little kid- thanks for the simple yet craveable recipe! I do prefer fresh, but I always keep frozen around and can make this anytime. Curious about the freezing. Do you freeze individual pieces? And how do you do it? I usually freeze 2-3 pieces at a time. First with plastic wrap and then a layer of aluminum foil. Thank you for the response. Excuse the probably stupid question, but do you then leave it out to defrost? Throw it in the oven? What? I usually defrost in the refrigerator first, but you could also re-heat frozen. Both the sweet and salty versions of spanakopita are equally as delicious. However, there is something truly special about the pites that are delicately spiced with caramelized or sautéed onions. This particular version is even more delicate with the addition of the nutmeg. Since not everyone likes dill, I often leave it out. I made your recipe last weekend, it was really good. I am planning to make it again soon! Made this to eat as lunches throughout the week accompanied by a tomato and cucumber salad and it is delicious! I also appreciate the ease of using frozen spinach. Looking forward to trying other pites!! Thanks Brianna! Glad you enjoyed it! Hi Elena, I absolutely love your recipes! I made your Spanakopita recipe and your fasolakia. They were both so delicious and my goal is to make a few of your dishes every week. I’m half Greek and am trying to get more in touch with my roots. My yiayia shows me how to make meals also but you know how it is with measurements (a little this a little that). 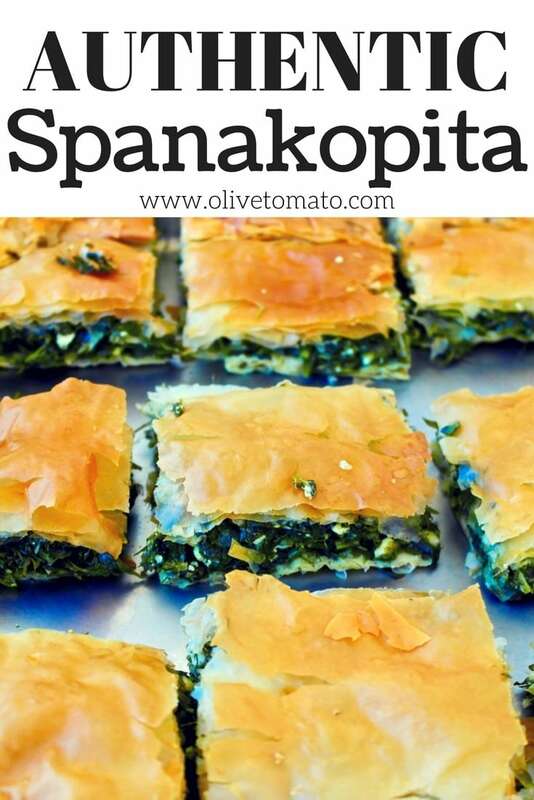 I’m wondering if I were to use fresh spinach for the spanakopita how would the recipe change? Is it still 1lb of fresh spinach and do I still sauté with the soft onions and follow the same steps? Thank you in advance! 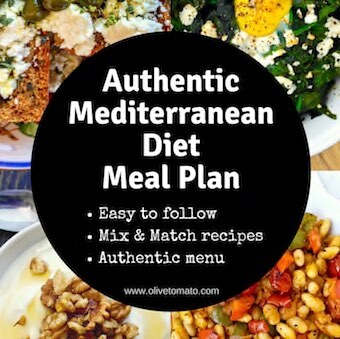 I am from Australia and I am really loving the recipes on your site. My only problem is that in Australia we use metric measurements and I am having a lot of trouble doing the conversions, e.g., I’m not sure what 1 pound of frozen spinach is in grams as well as 10-12 ounces crumbled and grated feta in grams. Can you please help? I made this pie today and all I can say is OMG … it’s delicious and so easy. I was so nervous to start with because of the filo pastry!! I got 12 slices out of it. Had 2 slices with greek salad (tomatoes, cucumber and olives with red wine vinegar and olive oil dressing (no cheese) for lunch and I am planning on having 1 slice with a salad for dinner. Is this ok? Do I need to add anything else to the meal?